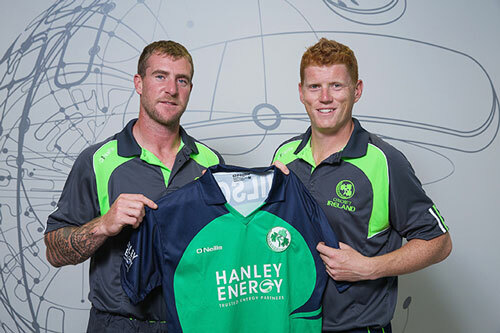 Cricket Ireland have announced that Hanley Energy are to become the primary sponsor of the Irish Cricket Team until the end of 2015. The partnership which takes immediate effect will be reviewed at the end of the year and ahead of the ICC Twenty20 World Cup in India next March. The Hanley Energy logo will now appear on the team playing kit for the remainder of 2015 including for the Hanley Energy Challenge against World Champions Australia on 27th August in Stormont. Hanley Energy are set to reap the rewards from the additional exposure they will gain through Cricket Ireland offline and online channels including reaching a global audience through the live broadcast coverage of the Ireland versus Australia fixture and the continuous growth of the Cricket Ireland social media platform which now has over 400,000 fans globally. Commenting on the partnership at their new recently opened data centre research and development hub at Hanley Energy HQ, Clive Gilmore, CEO said, “Hanley Energy is proud to announce its further commitment to Irish Cricket with this exclusive sponsorship deal, building on our support for the Hanley Energy Inter-Provincial Series. 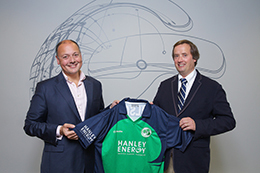 Cricket Ireland CEO Warren Deutrom also commented, “We are delighted to deepen our relationship with Hanley Energy who have reinforced their commitment to Irish Cricket at all levels by taking the step up to become our team sponsor until the end of this year. Hanley Energy, are a globally-recognised Irish-owned and managed company and market-leading specialists in energy-efficient data centres. They supply, design, install and support data centre control equipment and critical power solutions for a diverse range of business sectors. Hanley Energy help their clients to reduce energy costs, ensure 100% up-time and maintain competitiveness. They have Irelands only data centre research and development hub at their Irish headquarters confirming their reputation as innovators within their field.